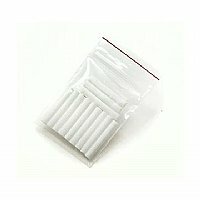 12-pack for the plastic aromatherapy inhalers. We have two styles of inhalers: the metal and the plastic, and each has a different size of cotton wick. If you're looking for replacements for your metal inhaler, please click here. Review: Other inhalers do not allow replacement of the wicks without destroying the container. Thank you for the ability to disconnect the closing cap, remove used wick, replace with a new one, and close the inhaler. To me it is a waste to throw perfectly good inhalers away, when then can be used more than a couple of times. Thank you so much! I will be back.